Since the cave goblins began making contact with our kingdom, I've had many visits from an especially inquisitive member of this gentle race. One tale she told of her youth charmed me so greatly that I felt compelled to write it down. Keeping one's quill active is of the utmost importance to men of learning! Beyond the city, solid rock stretched forever in all directions. The city-dwellers had dug mines, and the mines connected to caves, but however far they dug they would only ever touch more caves and more rock. The city was the world, a habitable void in a universe of solidity. That was what Zanik believed. She hadn't been taught it, exactly, but whenever she discussed the theory with her classmates, the teachers would just smile and nod, so it must be right. Zanik was in the caves now, clambering easily through a sloping tunnel that would have been too low for most adults to pass. Behind her she could hear Dorgan scrabbling inexpertly in the dark. She had explored these caves countless times but it was better to share her adventures with someone else. Dorgan stopped, catching his breath. Zanik looked back and saw the boy's round face bobbing in the light of the lamp she had been pushing ahead of her. "We shouldn't be out this far," he said. "We ought to go back." Zanik laughed. "Oh, don't be boring," she teased. "Those rules are for children, and we'll be full adults next year. I've been here loads of times." Dorgan didn't answer, but when he started moving again it was forwards rather than back. Zanik laughed again and scrabbled ahead of him. "It's not far now - wait and see!" Their little tunnel opened out quite suddenly. Zanik sprang to her feet and ran into the middle of the circular cave. She put the lamp down carefully, right under the apex of the domed ceiling, trying to find the exact position she remembered. Dorgan was standing beside her. "What are you doing?" She grinned impishly but did nothing to explain, instead grabbing his lamp and setting it down next to hers. She lay down next to them, motioning Dorgan to lie beside her. The floor was smooth stone, very slightly damp; it had a smell of lichen. Above them the domed ceiling faded as she dimmed the lamps. There! The ceiling was black, but with just the right light level, tiny specks appeared - quartz crystals catching the light. She lay back and let her eyes adjust, listening to Dorgan's breathing as he did the same. There were maybe a dozen bright specks and hundreds of dimmer ones, seeming to twinkle in the flickering lamplight. With the ceiling so dark, her eyes lost all sense of distance. It was easy to imagine the cave was any size - even the size of the whole city - and the reflections were perfect white lamp-orbs suspended in the dark space. It was beautiful; it was like nothing else she had seen. "It's nice," Dorgan said at last. Zanik shot him a look of mock-indignation. "Nice?" "It's lovely," he hurriedly corrected himself. "I really like it." Zanik laughed, and settled onto her side to look at Dorgan past the cosy glow of the lamps. Dorgan suddenly broke eye contact, and pulled a little cloth bundle out of his pocket. "I, um. I got you something." Zanik unwrapped the bundle. Inside was a necklace, a big disc-shaped pendant of blue glass with a silver pattern. She span it on its chain, watching the irregular facets catch the lamplight and cast their images on the roof. Zanik didn't much care for jewellery, but she was touched by the gesture. She put it on, and tucked it inside her top for safety. "Thank you," she said. "It's pretty." Dorgan smiled shyly. "Just pretty?" Zanik leaned over and kissed him. The lamps wobbled and almost fell. There was a rumbling sound. "What was that?" said Dorgan. Zanik sprang to her feet excitedly. "Earthquake!" Earthquakes were rare; only a couple of small ones had happened in Zanik's lifetime, and there hadn't been a major one for generations. "What will we do? The cave will collapse!" Zanik had already grabbed her lamp and was on her way back down the tunnel, feet first in a controlled slide. Dorgan called for her to wait. She emerged from the bottom and raised her lamp high. The little crawlway to her quartz-crystal cave was at right angles to an artificial tunnel, its ceiling reinforced with curving bone supports. It led back to the city in one direction and to a disused mine section in the other. There was something else now. A little way from where she was standing, a set of supports had collapsed and a crack had opened in the wall. She dashed off to look at it, just as Dorgan was emerging from the crawlway. "That...that wasn't here before?" Dorgan panted. "The quake must have opened it." Zanik crouched down next to the crack and shone her light inside. The walls were solid, but the floor was a mess of debris. She couldn't see how deep it went into the wall. Zanik frowned, noticing something. She pulled the lamp out of the crack and put it by the wall, then leaned back into the crack, waiting for her eyes to adjust to the blackness. "What are you doing?" Dorgan fretted. "Shh!" Zanik concentrated. She shouldn't be able to see anything, but a patch of gravel was picked out by a very faint light, just on the edge of vision. If it wasn't her imagination, there was a light coming from somewhere above. Zanik shifted onto her back and began pulling herself into the crack. The rock above her was totally dark, but with her fingers she could feel the roof getting higher. The stones under her back shifted uncomfortably. She could just see a glimmer of light. "Zanik! Come back!" Dorgan's voice was hushed and intense, as if a loud noise could cause another earthquake. "It's not safe!" "I'll be okay," said Zanik distractedly. She was sure she could see something now: a light picking out details in a wall towering above her. She must be at the bottom of a chimney in the rock, with some kind of light at the top of it. If she could just get a bit further in, she'd be able to see the light source itself. The rocks beneath her shifted again. Zanik's heart pounded and she pushed herself further into the crack. She knew she should go back, but she was sure that just one more push... She saw it! A sliver of blue at the top of the chimney, she had no way of knowing how high up. She held her breath and edged herself just a little further in, hoping to see it more clearly. It was bright blue, mottled with some kind of uneven whiteness. The rocks beneath her shoulders shifted and were gone. She made a desperate scramble back towards the tunnel, but too late. All the debris began to move and she slid backwards. She could hear Dorgan screaming her name as she was consumed by the dark. Rocks fragments pelted her from all sides as she was carried downwards - not so much falling as riding on top of a steady collapse. It was several panic-stretched seconds before she came to a stop, rock dust settling onto her skin. She lay still, expecting any movement to set off another collapse. She pulled her spare torch and tinderbox from her belt and forced her shaking hands through the familiar routine of making light. It took her several increasingly frantic attempts before the flame caught. The floor and ceiling of the cave were smooth and quite solid, and there was no monster to be seen. Rubble lay in a heap where it had spilled out from the crack in the wall. She leaned into the crack and looked up but she couldn't see the light. The collapse must have carried her along as well as down. "Dorgan?" she called out, surprised at how frail and uncertain her voice sounded. "Zanik!" Dorgan was practically crying with relief. "Are you all right?" "Wait there! I'll go get help! I - I won't be long." She heard Dorgan's footsteps receding into the distance. Zanik looked around, breathing deeply to calm herself. The cave sloped down away from her and narrowed into a tunnel that led off into the blackness. It would take Dorgan at least half an hour to get to the city and back, and now that she knew she was safe her urge to explore was returning. After a few moments of uncertainty her curiosity overcame her caution. She might be the first person to see this tunnel for centuries! She would go just a little way and then come back. The tunnel was smooth-walled and it never branched; Zanik guessed that a now-extinct river had carved it out of the rock. It curved back and forth so that she could not see even to the extent of her torchlight, always sloping gently downwards. With the tunnel so featureless she found it hard to guess how far she had gone. She was on the verge of turning back when she saw something that made all her exploring worthwhile. Nebulous shapes, glowing with soft blue light, floated back and forth in a seemingly endless void. Each one was perhaps the size of a person, roughly spherical but always shifting in shape and size. There was a swarm of them, all circling and approaching and retreating in a marvellously complex pattern. Sometimes a few would break off and spin together before rejoining the group; at other times two would merge and pulse brightly as the others swarmed around them, before separating and re-joining the flock. All around, Zanik thought she could hear voices singing - tragic and lonely voices, and yet serene. Zanik stepped forward, mesmerised. The tunnel emerged onto a wide ledge on the edge of a chasm, over which the lights floated effortlessly. The ledge ran along the chasm wall in both directions, and a little way to Zanik's left she could see something like a huge coil of thick green rope. It lay at the mouth of another tunnel or cave, from which issued the gentle sound of running water that Zanik had taken for singing. Zanik approached the coiled thing. It was a creature of some sort, its skin covered in tiny green scales like those of a cave crawler. It expanded and contracted very slowly, as if breathing. The creature shifted and let out a snort, making Zanik jump. A smooth reptilian head emerged from the coils and looked Zanik up and down. Its voice was soft but resonant, seeming to come from every direction at once. Its tone was not unfriendly, or even particularly interested, just weary. Zanik stared in disbelief, but the creature's words hung in the air and demanded reply. The creature snorted again and rested its head on its coils. "You Dorgeshuun do not interest me," it said. "Not one of you is worthy to enter this cave. Go back to your city and let me sleep." Zanik had barely noticed the cave behind the creature. It wasn't very large, but as the floating lights drifted past the opening she could see water trickling down the walls and disappearing into the floor. It didn't look particularly remarkable, but the creature's patronising speech made her desire to enter it intense. "Maybe I am worthy," she said. "You are not. All of you are the same: living your tiny lives, never looking outside your city; shutting yourselves off from the world above. Yours is a civilisation defined by a fear of the unfamiliar." Her face smacked into a wall of cold scales. With a movement so fast it was invisible, the creature was there in her path. She landed heavily on her back, only centimetres from the edge of the chasm. The creature was rearing over her, its whole body writhing with barely-restrained rage. "And now your heritage asserts itself," the guardian continued. Its voice was now full of power and authority, and Zanik felt sure that it would be utterly impossible to enter the cave without its permission. "You take what you want by force. Your race was created for violence; it is your purpose and your sole destiny. But no violence will gain you entry here. If you attempt to pass me again, I will send you to the bottom of the chasm." The creature relaxed and began to coil itself, finally taking its eyes off Zanik. Zanik stood up, tasting blood in her mouth, and picked up her torch. The guardian was ignoring her; it seemed to be going back to sleep. She sat down next to it and watched the lights float back and forth in the darkness. "You are still here," the creature said at last. "I'm not scared of you," Zanik lied. "Your kind has always gone running back to your city when I showed them my power. Perhaps you are a rare individual." "Tell me what you are," said Zanik. "My name is Juna," the creature said. "I am a servant of the almighty Guthix. My lord honoured me with this task, to guard the cave that contains his tears and to choose who is and is not worthy to enter." "Who is Guthix?" asked Zanik. "How can his tears be in the cave?" "Guthix is the true owner of the world. All nature is his domain: every plant that grows, every creature that moves and breathes. He is the greatest of all the gods." "The greatest of all the gods," Juna repeated. Zanik looked at the creature in disbelief. "Don't be silly! The gods aren't real. They're just a story made up to scare children - 'You mustn't go too far or the gods will see you.'" "That is what you believe?" "Of course! No one really believes in gods." "Then the folly of your people has grown even greater. To reject your god and to hide from him, that is blasphemy; that is a betrayal of all that you are and should be. But to deny that the gods exist...there is not even a word for what that is." Juna pointedly turned away from Zanik and buried her snout in her coils. "I'm sorry," said Zanik. "I didn't mean to upset you." "Leave me," said Juna, not looking up. "Go back to your city. Barricade the tunnel and put up warning signs, as you have every time before. Forget about me and leave me to my vigil." "Barricade the tunnel? You mean people have been here before?" Zanik stood and walked back along the ledge, a little shaken by the conversation's abrupt end. She reached the dead river channel and paused. There had been no barricade at the top, or warning signs, and that meant Juna had been talking about a different tunnel. She continued on. The ledge sloped upwards, in one place becoming so steep that Zanik had to climb with her hands. The floating lights sometimes hovered close and she wondered if they were aware of her presence; she tried to attract them by waving her torch, but they did not seem interested. She eventually came to another opening in the wall, this one a tunnel leading steeply upwards. The tunnel was nowhere near as long as the river channel. As Zanik had expected, it ended in a barrier of long bones held together by iron pins. She braced herself against the rock and kicked it open. The tunnel emerged into a mossy cave with an algae-filled river running across it. A pair of giant frogs lumbered nearby, but Zanik knew how to tread lightly and not look edible. She recognised the place quickly; she had passed this barrier dozens of times but had always assumed that it warned of an unstable tunnel section or some other mundane hazard. She hopped across the river and started back towards the city. Her path took her through the abandoned mines and past the place where the earthquake had happened. Two city guards were standing there, dressed in iron chainmail and leaning on their spears. She couldn't see Dorgan. The guards spotted her, and one of them ran over. "Zanik?" "Where have you been? Mernik is worried sick. Do you have any idea how long you've been gone?" The guard practically manhandled her back to the city. She tried to tell him about the chasm and the floating lights and Juna, but he just scolded her for making up stories. By the time they reached the great iron door and passed through into the familiar bustle of the city, she had retreated into a sullen silence. The city lights were dimming for the evening. Mernik and Dorgan were standing outside the door to the nursery complex. Mernik looked even older and more lined than ever, but only for a moment; as soon as she saw Zanik, she broke into a smile. She hugged Zanik close as if trying to lift her off her feet, although it had been many years since Zanik had been small enough for that. Everyone knew that Mernik was one of the most important people in the city, although she had no pompous title like the members of the council. She was the head of the nursery complex, both mother and tutor to a whole generation. Zanik had no idea who her birth-parents were, and she would have been astonished at the suggestion that she might want to know. Like all city-dwellers, she had been raised in the communal nursery by a legion of nursemaids and teachers, with Mernik a strict but loving presence at the top of it all. "Thank the city you're safe," Mernik said, releasing Zanik at last. "Now get inside and clean yourself up. You look exhausted." Zanik was tired, and Mernik's hug had made her ache all over. Mernik went inside, leaving the door open. The guard had also gone, leaving Zanik and Dorgan alone. Dorgan edged towards her. "I'm glad you're safe," he said. Zanik grinned. "Not as glad as I am!" Dorgan returned Zanik's smile for a moment, but then looked down at his hands, which he was kneading together in little nervous motions. "You shouldn't have gone off like that," he said quietly, with a resentful tone competing with the nervousness in his voice. "I was worried." "I didn't mean for you to worry. I was going to come back, but then I found this chasm, and there were these lights, and this creature, and it talked. You wouldn't believe it! Tomorrow I'll show it to you." "No!" Dorgan reached for Zanik's hand; reflexively, she pulled away. His eyes were stretched even larger than normal with a look of frightened pleading. She had seen a hint of that expression on the faces of many of the grown-ups: a faint, subdued panic, as if the slightest misstep could lead to untold danger. Suddenly she couldn't imagine why she had ever found Dorgan attractive. "Don't go there again, Zanik," Dorgan continued. "Promise me you won't go off exploring again. Stay in the city and be safe with me." The nursery complex was above the city's ground level; from here Zanik could see out across the cavern. On the main floor below, hundreds of city-dwellers walked among the statues and waterways and chaotic market stalls. Beyond them, the façades of shops and houses rose tier upon tier up the far wall of the cavern. Pillars and arches stretched from the ground to the ceiling, just visible by the hundreds of light orbs running along every wall and walkway. Somehow it all seemed smaller than it had yesterday. "I can't promise that," said Zanik. "I'm sorry." She went inside and left Dorgan to his city. The next morning Zanik's class had a lecture from the city scribe. She tried to tell her friends about the previous day's adventure, but those who believed her at all were just like Dorgan: shocked that she had put herself in danger. When the lecture started she sat towards the back, pretending to pay attention while she made a sketch of Juna and the floating lights on her writing slate. Stone tablets in the city's store rooms stored the minutes of City Council meetings for the last eight hundred years, the little bespectacled man was explaining. Of course, the Council had existed far longer than that, he went on, but records were patchier and less reliable. Up on the blackboard was a key to the complex formal notation in which the minutes were kept. Zanik could hardly have been more bored. Eventually it came to an end and the class filed out. Zanik would normally have been the first out, but this time she stayed in her seat as the scribe wiped the board. Dorgan hung in the doorway for a moment, but then looked at his feet and disappeared. The scribe turned from the board and blinked at Zanik through his glasses, as if he couldn't believe she was still there. "You have a question? Uh, Zendak, wasn't it?" "Yes, of course. If you want to know more about the Council notation, I have several books that you could borrow." "I'm not interested in the notation." Zanik resisted the urge to put it in stronger terms. The scribe slid his notes into a little bag and clicked it shut neatly. "Then what can I do for you?" "Tell me about Juna, and the chasm of the floating lights." The scribe looked puzzled. "I believe I may have read something about that. Would you come to my study so I can look it up?" The scribe's study was an annexe of the Council Chamber, and busts of long-dead council members looked down on them as he leafed through his notes. After much looking up of indexes, cross-referencing, and noting down of page numbers, he pulled a dusty volume from a shelf and opened it out on his little work-table. Zanik peered at the book but the writing was tiny, and most of it was in the arcane council notation. "What does it say?" The scribe traced his finger across the page. "Extraordinary Council meeting to hear Exploratory Division report, Ur-golt presiding ... year of the city ... well, it's about three hundred years ago. Exploration of collapsed area revealed new tunnel leading to large chasm. Unknown optical phenomenon resembling living creatures of light. Creatures were attracted to blue-tinted lanterns. Creatures seemed insubstantial but were able to pick up objects; one of them carried a blue lantern away across the chasm. Division also encountered a large worm-like creature that spoke to them. Demonstrated great physical power and threatened to throw Division into the chasm if they did not leave. Exploratory Division of the opinion that the chasm and its inhabitants are dangerous. Council resolves to block up tunnel to chasm and erect signs designating it off-limits to all." "That's it?" asked Zanik. "They didn't send another expedition?" "No. If they had there would be a note here. Elgon was very thorough in his cross-referencing." "They just blocked it off," said Zanik in disgust. "So when were you going to tell us about it?" "When were you going to put it in your lectures?" Zanik waved her hand in inarticulate anger. "You've told us about the backup power station and the rules for the market traders and...and the stupid codes you use to write the council minutes! Why haven't you done a lecture on this?" The scribe was fumbling with his pen anxiously. His face showed the same nervous look that Zanik had seen on Dorgan the night before, and she wondered contemptuously whether he had ever gone outside the city gates. "There are lots of details in the history we don't include in lessons," he said. "We have to narrow it down to what's important." "Important?" shouted Zanik. "There are lights that shine on their own, when you told us only we can make light! There's a talking animal, when you told us only we can talk! How is this not important? What else is there that you're not telling us?" "Zanik, I don't know what you want to know. That chasm isn't important. It's a curiosity, nothing more." "Yes, it's a curiosity! So why is no one curious about it?" Zanik stormed out as stormily as she could. The earthquake crack was now hidden behind a big leather screen, and a sound of careful hammering emanated from inside. A guard eyed Zanik sternly as she approached and readied his spear to block her path, but relaxed when she walked past the crack and deeper into the abandoned mines. The older tunnel down to the chasm had no guards, and the bone barrier lay where Zanik had kicked it. This time, Zanik had brought her best lantern, a high-quality model with a directed beam. It lit up the ledge brilliantly and made her much more sure of her footing, but the way that the beam faded into the dark expanse of the chasm made the space feel even bigger than before. Juna blinked awake in the white glare of the beam. "You have returned," she observed. "It is unusual for one of your kind to visit me twice." "I know," said Zanik bitterly. "You have my interest, Zanik of the Dorgeshuun. But you must do more to prove yourself worthy of entering the cave. How can you show me that you stand out from the rest of your people?" A brief chill ran through Zanik; she did not remember telling the creature her name. She swallowed nervously. "I can fly." Juna made an amused snorting sound, not quite a laugh. "A flying Dorgeshuun? That would certainly be worthy. Please proceed." Zanik took a few steps away and placed the lantern in a nook in the wall. She pulled Dorgan's pendant from inside her jacket pocket. It wasn't a bad present, she thought, but it hadn't been right for her; she hoped Dorgan could find some other girl who would appreciate that sort of thing. With only a brief moment of regret, she snapped it from its chain. Using a piece of cloth to protect her hands from the hot metal she unscrewed the lantern lens, and then jammed the pendant in its place. The lantern now cast a dimmer, unfocused beam, but one of pure blue light. 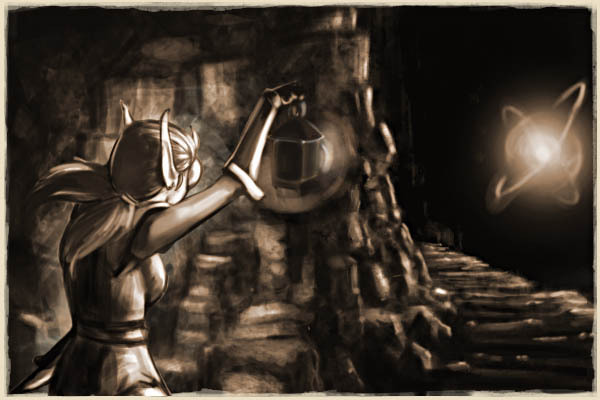 Tucking the lens into her pocket, she picked up the lantern and walked to the edge of the chasm. Juna watched with an expression of patient amusement. Zanik cast the blue beam around, trying to keep it trained on one of the floating lights. For a while she thought nothing had happened, and she was sure she could feel Juna's mocking gaze on her back. Then she saw one of the light creatures pause in the blue beam and come sliding down it towards her. The beam wobbled; she tried to keep her hands from shaking. The light creature was right in front of her now. Close up it was even more unreal, an area of diffuse blueness filled with criss-crossing beams and glittering bursts that were hard to focus on. It stretched and squeezed to stay within the narrowing light beam, and then enveloped the lantern in a sudden movement. Zanik had expected the creature to tug at the lantern. Instead, it felt like the lantern became weightless and started to float away from her of its own accord. She pulled it tightly to her chest. "If you want this, you'll have to take me as well." The creature flowed from the lantern and on to the skin of her arms. She felt no sensation at all, but she could see it moving outwards, slowly engulfing her entire body. It reached her head and the whole world was hidden behind a shimmering blue veil. A feeling of lightness spread through Zanik's body. Then, with no sense of movement, she realised that her feet were no longer on the ground. She looked back and saw the ledge receding and Juna looking on impassively. It was pleasant, but Zanik's heart pounded and she gripped the lantern so tightly that her fingers hurt. Suddenly, she was terrified, and all she could think of was how absurdly dangerous her plan had been. Her legs thrashed involuntarily, trying to run back to Dorgan and all the other cautious, sensible people of the city, to shut herself in and be safe and never leave. She was suspended over an unknown depth by nothing more substantial than light. The creature was carrying her along the path of her lantern beam; she would be able to direct it by shining the beam where she wanted to go. It took all her willpower to still her flailing limbs and control the movements of the wobbling blue circle on the far wall. There was another cave up there, with a little path running from it back down to Juna. She tried to keep the beam focused on that. As soon as her feet touched the ground, her legs collapsed under her and she fell flat on her face. The blue beam was now shining straight into the rock, and the light creature withdrew. Still trembling, Zanik picked herself up. Down below she could see Juna and her cave, and the place where she had taken off. She laughed out loud. She had made it! Zanik swapped the normal lens back into the lantern. Even without the blue filter, the rocks in this cave still had a blue tinge, and she couldn't identify their type. She took her student? "s pick from her belt and hacked off a piece as a trophy before scrambling down the ledge back to Juna. The creature was nodding her head up and down vigorously, as if attempting to applaud without hands. "Very amusing," she said. "A most entertaining spectacle. I shall require all future visitors to perform the same feat." Zanik grinned, slightly out of breath. "So, you'll let me into the cave now?" Juna nodded. "I will. The stone you retrieved will make an adequate bowl to catch the tears." It was a moment's work for Zanik to work the stone into a crude bowl using her pick. Her every blow broke away a brittle shard and revealed tiny cracks that ran right through it, as if the stone was inhabited by miniature tunnelling people. When it was done, Juna lifted her tail and let her into the cave. The sound of trickling water was all around her now, more like music than ever, and the very air of the cave seemed to be filled with a beautiful sadness. Water ran down channels in the wall, green and blue, coming and going in spurts. Zanik held her bowl up to a stream and watched the water collect, moving from one to another as they appeared and disappeared. After what seemed like only a few moments, Juna shouted for her to come out. "Now drink the tears," said Juna. "Let the power of Guthix fill you." 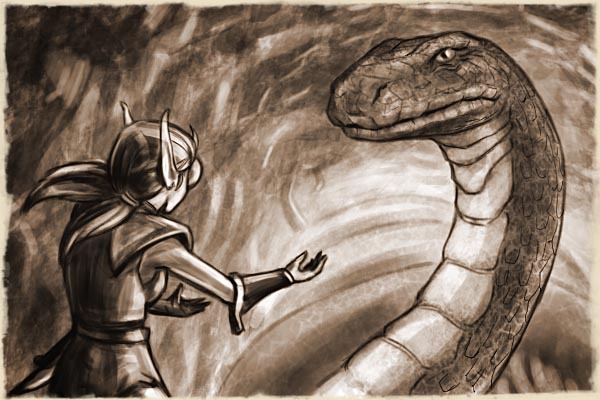 Zanik wanted to tell the old creature that there was no Guthix, and whatever was special about the tears must be natural, but she thought better of it. She tentatively lifted the bowl to her lips. It tasted like ordinary water, salty and with a hint of minerals, but unremarkable. But as she lowered the bowl she felt an indescribable sense of being changed. It was a small, subtle thing, but she was sure she had become just a little steadier, a little more sure of herself. Suddenly, she knew exactly where she was. There was a look of silent understanding in Juna's dark eyes. Zanik put her bowl down and walked back towards the city. The leather screen still hung over the crack in the tunnel wall. The sound of hammering was gone; instead, Zanik could hear quiet voices in discussion. The guard barely glanced at her, no doubt assuming her to be on her way back to the city after some childish adventure. She walked in front of him and then quickly darted past his spear and into the crack before he could react. It was even easier than she had expected. The crack had been enlarged, and the area behind it was brightly lit by oil lamps placed around the wall. There was a level floor of tightly packed stones, artificial and solid. The cave itself was larger than Zanik had remembered, easily big enough for the three people that occupied it. In the middle of the cave was Ur-lesh, the ancient headwoman of the Council, leaning heavily on an ornate bone cane. She was completely blind, her eyes scrunched up amid the wrinkles of her face, but she had focused unerringly on the sound of Zanik's entrance. Facing her was the city scribe, looking young by comparison, staring at Zanik in astonishment. Behind them, next to one of the little bundles stuck all over the walls, was another old man, with tufts of white hair surrounding an impressive bald dome. Zanik recognised him as Oldak, the city's Council-sponsored wizard; his lectures on natural philosophy were some of the less boring she had had to sit through. The scribe's startled look changed to one of anger. "Zanik!" he hissed. "You're not allowed here!" The guard was already coming in through the screen; Zanik prepared to dodge. "No!" Ur-lesh's voice was quiet but had a natural air of command. "Zanik, why have you come here?" Zanik took a step into the cave. "You lied to us," she spat. "All of you. You knew the truth about... about up there, about the real shape of the world. There's a whole place up there, that we came from, and you kept it a secret." Zanik was standing at the bottom of the rock chimney now. The light was dimmer than before, a circle of deep blue just visible against the black of the shaft walls. Ur-lesh sighed. "It is not a secret, as such," she said. "It is just something we do not speak of in front of children. We prefer you to remain innocent." "I'm not a child any more!" Ur-lesh waited for the echoes of Zanik's voice to die away. "No," she said, "I do not believe that you are." "What you have worked out is correct. Up above us is a place known as the surface, and you are right, it no doubt could be considered a whole world. Our ancestors, who founded the city, came from the surface. Since then we have had no contact." "Well we've got contact now!" Zanik said triumphantly. "The shaft is open! You'll have to send an expedition to the top to explore." "She's right, you know," Oldak interjected. "There are ways we could observe with very little risk." "Yes!" said Zanik. "And I want to do it." "You do not understand," said Ur-lesh. "And you, Oldak, appear not to remember," she added pointedly. "Zanik, it is no accident that we have stayed isolated from the surface for all these generations. We keep it that way. Tomorrow we will seal this shaft and make sure that there can be no contact with the surface." "Why?" demanded Zanik. "What's so terrible up there?" "War," said Ur-lesh, bowing her head, as if remembering back to the day she first learned the secret. "A war so terrible that we cannot even imagine it. Armies many times the size of our population, forced to fight on and on by powers they could not resist." Ur-lesh's voice had lost its power but had become more earnest, and Zanik realised with a chill that the old woman was genuinely frightened. Ur-lesh continued. "Zanik, the gods are real." Ur-lesh stood patiently, waiting for Zanik to digest the information. Zanik's mind reeled. The gods were fairy-tale villains; they represented all that was evil and controlling and unjust. The idea that they were real turned Zanik's world-view on its head even more than the existence of the surface had. "The war might be over," said Zanik weakly. Ur-lesh shook her head. "We cannot take that risk. As long as this shaft remains open, the gods may find us." Zanik nodded. She turned to leave, defeated, but took one more look up the shaft at the patch of dimming light. High above, a tiny white speck had appeared, like a quartz crystal catching the light. The distant explosion echoed up and down the chasm. The light creatures continued their dance, unconcerned. Their whole existence was light; Zanik doubted they could hear anything. She lay amid Juna's heavy coils, feeling the serpent's breathing carry her gently up and down. Perhaps out of kindness to Zanik, the council had left the old way to the chasm un-blocked, and Juna's cave had become her private hideaway, where she could go to escape the city into which she no longer quite fitted. Juna had become her strangest friend, eagerly devouring any stories she could tell about her life, as if meeting Zanik had awakened in the old serpent a long-dormant hunger for excitement. Juna had confirmed Ur-lesh's story about the war. Fighting among the lesser gods had nearly destroyed Guthix's creation, and that was why the nature god had wept the tears that still trickled down the cave's walls. 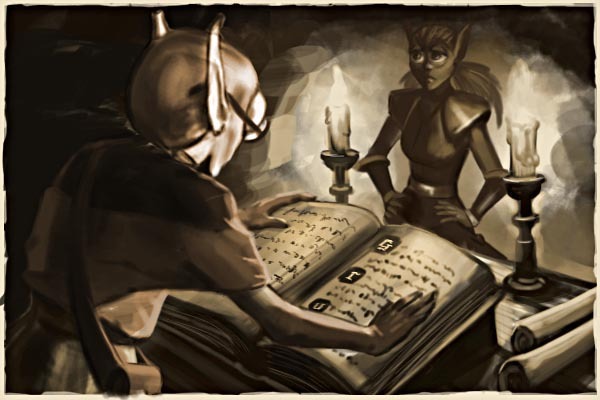 According to Juna the war was over, ended at the command of the almighty Guthix, but the council would never risk believing that. Listening to the soft, sad trickling of the tears, Zanik looked up past the light creatures, trying to make out the roof of the chasm. Up past that rock, perhaps only a few dozen meters thick, was a whole other world, a world of adventure she couldn't begin to imagine; a world with a blue sky that went on forever. Someday, she vowed to herself, she would see it.